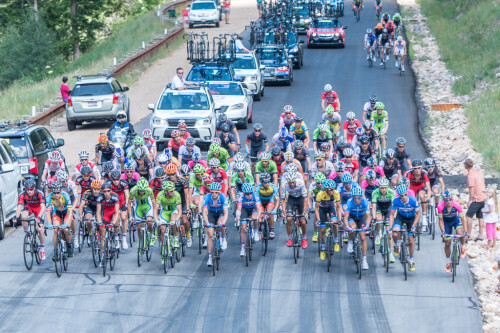 August 10, 2014 – PARK CITY, Utah – Garmin-Sharp’s Tom Danielson fended off all challengers and climbed his way to a second straight Larry H. Miller Tour of Utah championship. 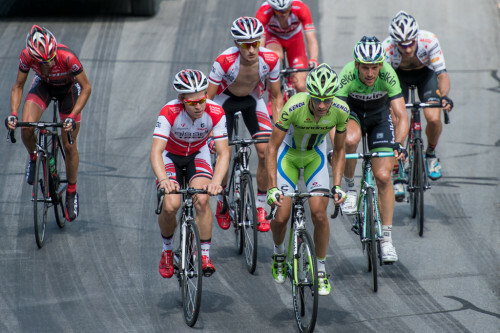 Cadel Evans, the Australian 2011 Tour de France champion for BMC Racing Team, used a thrilling descent from Empire Pass into Park City to win Stage 7 presented by VLCM and Barracuda Networks. Evans, who was the winner of Saturday’s Queen Stage at Snowbird, charged ahead of Danielson, Lampre-Merida’s Chris Horner (USA) and Winner Anacona (COL) and Belkin-Pro Cycling’s Wilco Kelderman (BEL) into Park City to take his second Tour of Utah stage win in as many days. Danielson rode a tactically strong race, marking his closest opponents and responding to each attack. Danielson finished fifth on Stage 7 and lost only five seconds of the 57 second lead he held entering the final day of the Tour of Utah. Danielson completed the seven stages of ‘America’s Toughest Stage Race’ in 30 hours, 18 minutes and four seconds. Horner and Anacona rounded out the overall podium 52 seconds and 1:43 back, respectively. The Stage 7 win was not necessarily in the game plan for Evans. Evans summited Empire Pass with Carter Jones (Optum) in full sprint. After 2 switchbacks, Evans dropped Jones on the descent and rocketed down the 50-60 mph descent to catch the yellow jersey quartet at the front. Evans descended with them until the last corner, when he took a wide and fast far outside-inside line, carrying far more speed than the others, and held it to the line for his second win in two days. Evans finished sixth overall, 2:14 back. Ivan Basso (ITA) of Team Cannondale finished 42nd overall at 58:59 back while Trek Factory Racing’s Jens Voigt crossed the finish line 1:00:50 back and 45th overall. Tanner Putt (Park City, Bissell) was part of an early breakaway that lasted to the base of the Empire Pass Climb. Putt rolled over the Wolf Creek Pass KOM in first to take a few KOM points, and add a few dollars to the Bissell Team’s prize money. Putt also pleased the crowd on Empire Pass by riding a wheelie over the top. The Empire Pass caused some shuffling in the Top 10 overall as Anacona’s ride moved him one spot up in the overall standings ahead of BMC Racing Team’s Ben Hermans (BEL) and onto the final overall podium. Drapac Pro Cycling’s Lachlan Norris (AUS) slipping into 10th with a strong Stage 7 ride. Belkin’s Moreno Hofland (NED), the winner of Stage 1 and Stage 3, pulled out of the race during Stage 4. BMC’s Michael Schar (SUI) took the Stage 2 win in Torrey. Danielson took control during Stage 4 at Powder Mountain and Optum p/b Kelly Benefit Strategies’ Eric Young (USA) sprinted to victory in Kamas during Stage 5. Team SmartStop p/b CyLance’s Jure Kocjan (SLO), who finished second in three stages, won the Utah Sports Commission Sprint jersey. Hincapie Sportswear Development’s Joey Rosskopf (USA) used three strong mountain rides to win the Ski Utah King of the Mountain jersey while BMC’s Dylan Teuns (BEL) was named the Subaru Best Young Rider. Anacona’s strong effort supporting Horner earned the Colombian the Stage 7 Vivint Most Aggressive Rider jersey. With three riders in the overall top 13, Lampre-Merida took the Washakie Renewable Energy best team award. The Tour of Utah had four Utahns in the race with Jamis-Hagens Berman p/b Sutter Home’s Robbie Squire placed best at 21st overall, 14:50 back. Park City’s Tanner Putt, the two-time U23 USA champion, spent time in the Best Young Rider jersey and was part of several breakaways. Putt finished 35th overall, 50:57 back. Chris Putt, Tanner’s younger brother, was 58th at 1:12:59 back while local favorite Jeff Louder, United Healthcare, finished his final Tour of Utah in 75th, 1:27:35 behind. 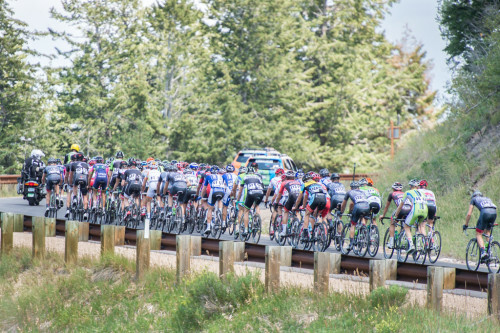 The 2014 Tour of Utah reached new heights, went to record lengths and set numerous milestones. The 10th edition of the race traveled 753.8 miles, climbed 57,863 feet and stretched from Cedar City and Torrey in the south to Powder Mountain and Evanston, Wyoming on the north. With three UCI Grand Tour champions – Basso, Evans and Horner – in the field, the Tour of Utah was as competitive as ever as it lived up to its moniker as America’s Toughest Stage Race. Steve Miller, president of Miller Sports Properties, said the race is growing as expected and the 2015 edition will be held from August 3-9 and new additions to the route are already on the drawing board. Organiser: Utah Cycling Partnership Inc.